The In Crowd is the grooviest 60s and 70s tribute band around, featuring Lisa, Nelson and Ava Arce...mother,father, daughter-founded act! Lisa fronts this show with her high energy, big voice,ever present smile, and go-go boots ( which she has in three different colors ). 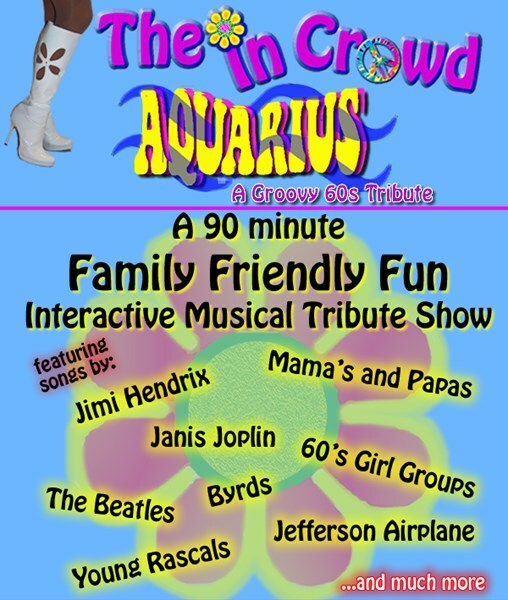 This band takes you back to 1969 but tributes the 60s and 70s with the best hits from Janis Joplin, Jimi Hendrix, the Beatles, the mamas and the papas, the zombies, Aretha Franklin, Linda Ronstadt, smoky Robinson, so much more... this is more than just a band though it is a show, with a 5pc band, complete with props, lights and a 60s living room feel, The In Crowd Brings you wayback! Please note The In Crowd Retro Show will also travel to Centerport, East Northport, Greenlawn, Huntington, Kings Park, Commack, Huntington Station, Cold Spring Harbor, Greenwich, Smithtown, Hauppauge, Melville, Stamford, Brentwood, Deer Park, Saint James, Woodbury, Central Islip, Nesconset, Oyster Bay, Stony Brook, Syosset, Wyandanch, Bay Shore, East Norwich, Lake Grove, Mill Neck, North Babylon, Old Bethpage, Plainview.